Momentum Support Group has a zero-tolerance approach to Slavery and Human Trafficking and is committed to preventing acts of slavery and human trafficking from occurring within both its business and supply chain. Our position on human rights within Momentum Support is evident through our Mission Statement “We do business ethically by keeping our promises to our customers, our staff and our suppliers”. We respect the rights of all our employees and those within our supply chain. Momentum Support is an outsourcing company established in 1982, providing award winning cleaning and security solutions to businesses and organisation based across Ireland and the UK. The company has approximately 2500 + employees and 240 + suppliers. The Momentum Support Modern Slavery and Human Trafficking Policy is in place for all stakeholders in the company including: Employees, Customers, Suppliers and any Sub-Contractors acting on our behalf. Momentum Support encourages all employees, clients and suppliers to report any activity they feel is unlawful conduct or have concerns about the risk of Modern Slavery. Please see our Whistleblowing Policy for further details regarding the process for reporting suspect activity. Identify, monitor and assess those areas of our business and supply chain most at risk from Modern Slavery and implement initiatives to enhance risk management effectiveness. Engage with our Supply Chain at the outset of our relationship to convey the importance of this policy as any noncompliance found may result in termination of contract. 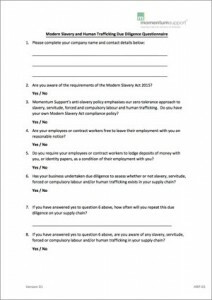 As part of our Supplier on boarding process they must complete a Modern Slavery Act Due-Diligence Questionnaire (Appendix 1). This questionnaire will highlight where the supplier is committed to ensuring a zero-tolerance approach. 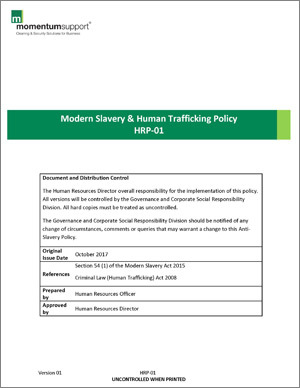 Momentum Support will ensure the recruitment policy is compliant with the Modern Slavery & Human Trafficking legislation. The Human Resource Department will be responsible for screening & vetting of new hirers. They will also be responsible for monitoring and auditing right to work visas. All new employees will receive training in relation to Modern Slavery and Human Trafficking as part of their induction training with the company. Employees will receive a copy of the Employee Handbook which will include our Modern Slavery and Human Trafficking Statement. Internal training courses and employee tool box talks will be provided to all employees in order to raise awareness of Modern Slavery and Human Trafficking. These training courses and employee toolbox talks will aim to fully educate and prepare managers, supervisors and human resources officers to identify the signs of Modern Slavery and Human Trafficking and how to handle an incident should one occur. Momentum Support will review this policy as an annual basis, it may be revoked, replaced or changed at any time to adhere with legislative amendments. The key areas that could be affected by Slavery and Human Trafficking are; employees hired by the company, employees working on our sites through sub-contractors and employees hired by our suppliers. Our Key Performance Indicator is that we have zero reports/instances of slavery or human trafficking in our supply chain and throughout our workforce.